↑ Bours V, Burd PR, Brown K, Villalobos J, Park S, Ryseck RP, Bravo R, Kelly K, Siebenlist U (Feb 1992). "A novel mitogen-inducible gene product related to p50/p105-NF-kappa B participates in transactivation through a kappa B site". Molecular and Cellular Biology. 12 (2): 685–95. PMC 364259 . PMID 1531086. 1 2 Bouwmeester T, Bauch A, Ruffner H, Angrand PO, Bergamini G, Croughton K, Cruciat C, Eberhard D, Gagneur J, Ghidelli S, Hopf C, Huhse B, Mangano R, Michon AM, Schirle M, Schlegl J, Schwab M, Stein MA, Bauer A, Casari G, Drewes G, Gavin AC, Jackson DB, Joberty G, Neubauer G, Rick J, Kuster B, Superti-Furga G (Feb 2004). "A physical and functional map of the human TNF-alpha/NF-kappa B signal transduction pathway". Nature Cell Biology. 6 (2): 97–105. doi:10.1038/ncb1086. PMID 14743216. ↑ Thornburg NJ, Pathmanathan R, Raab-Traub N (Dec 2003). "Activation of nuclear factor-kappaB p50 homodimer/Bcl-3 complexes in nasopharyngeal carcinoma". Cancer Research. 63 (23): 8293–301. PMID 14678988. Taylor JP, Pomerantz R, Bagasra O, Chowdhury M, Rappaport J, Khalili K, Amini S (Sep 1992). "TAR-independent transactivation by Tat in cells derived from the CNS: a novel mechanism of HIV-1 gene regulation". The EMBO Journal. 11 (9): 3395–403. PMC 556874 . PMID 1505523. Ruben SM, Klement JF, Coleman TA, Maher M, Chen CH, Rosen CA (May 1992). "I-Rel: a novel rel-related protein that inhibits NF-kappa B transcriptional activity". Genes & Development. 6 (5): 745–60. doi:10.1101/gad.6.5.745. PMID 1577270. Liu J, Perkins ND, Schmid RM, Nabel GJ (Jun 1992). "Specific NF-kappa B subunits act in concert with Tat to stimulate human immunodeficiency virus type 1 transcription". Journal of Virology. 66 (6): 3883–7. PMC 241175 . PMID 1583734. Biswas DK, Salas TR, Wang F, Ahlers CM, Dezube BJ, Pardee AB (Dec 1995). "A Tat-induced auto-up-regulatory loop for superactivation of the human immunodeficiency virus type 1 promoter". Journal of Virology. 69 (12): 7437–44. PMC 189681 . PMID 7494249. Jeang KT, Chun R, Lin NH, Gatignol A, Glabe CG, Fan H (Oct 1993). "In vitro and in vivo binding of human immunodeficiency virus type 1 Tat protein and Sp1 transcription factor". Journal of Virology. 67 (10): 6224–33. PMC 238044 . PMID 7690421. Alcamí J, Laín de Lera T, Folgueira L, Pedraza MA, Jacqué JM, Bachelerie F, Noriega AR, Hay RT, Harrich D, Gaynor RB (Apr 1995). "Absolute dependence on kappa B responsive elements for initiation and Tat-mediated amplification of HIV transcription in blood CD4 T lymphocytes". The EMBO Journal. 14 (7): 1552–60. PMC 398242 . PMID 7729429. Taylor JP, Pomerantz RJ, Oakes JW, Khalili K, Amini S (Jan 1995). "A CNS-enriched factor that binds to NF-kappa B and is required for interaction with HIV-1 tat". Oncogene. 10 (2): 395–400. PMID 7838536. Westendorp MO, Shatrov VA, Schulze-Osthoff K, Frank R, Kraft M, Los M, Krammer PH, Dröge W, Lehmann V (Feb 1995). "HIV-1 Tat potentiates TNF-induced NF-kappa B activation and cytotoxicity by altering the cellular redox state". The EMBO Journal. 14 (3): 546–54. PMC 398112 . PMID 7859743. Scala G, Ruocco MR, Ambrosino C, Mallardo M, Giordano V, Baldassarre F, Dragonetti E, Quinto I, Venuta S (Mar 1994). 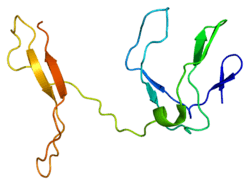 "The expression of the interleukin 6 gene is induced by the human immunodeficiency virus 1 TAT protein". The Journal of Experimental Medicine. 179 (3): 961–71. doi:10.1084/jem.179.3.961. PMC 2191426 . PMID 8113688. Bours V, Azarenko V, Dejardin E, Siebenlist U (Jun 1994). "Human RelB (I-Rel) functions as a kappa B site-dependent transactivating member of the family of Rel-related proteins". Oncogene. 9 (6): 1699–702. PMID 8183565. Deloukas P, Dauwerse JG, van Ommen GJ, van Loon AP (Feb 1994). "The human NFKB3 gene encoding the p65 subunit of transcription factor NF-kappa B is located on chromosome 11q12". Genomics. 19 (3): 592–4. doi:10.1006/geno.1994.1115. PMID 8188306. Westendorp MO, Li-Weber M, Frank RW, Krammer PH (Jul 1994). "Human immunodeficiency virus type 1 Tat upregulates interleukin-2 secretion in activated T cells". Journal of Virology. 68 (7): 4177–85. PMC 236340 . PMID 8207793. Dobrzanski P, Ryseck RP, Bravo R (Mar 1993). "Both N- and C-terminal domains of RelB are required for full transactivation: role of the N-terminal leucine zipper-like motif". Molecular and Cellular Biology. 13 (3): 1572–82. PMC 359469 . PMID 8441398. Harhaj E, Blaney J, Millhouse S, Sun SC (Feb 1996). "Differential effects of I kappa B molecules on Tat-mediated transactivation of HIV-1 LTR". Virology. 216 (1): 284–7. doi:10.1006/viro.1996.0062. PMID 8615004. Conant K, Ma M, Nath A, Major EO (Mar 1996). "Extracellular human immunodeficiency virus type 1 Tat protein is associated with an increase in both NF-kappa B binding and protein kinase C activity in primary human astrocytes". Journal of Virology. 70 (3): 1384–9. PMC 189957 . PMID 8627654. Demarchi F, d'Adda di Fagagna F, Falaschi A, Giacca M (Jul 1996). "Activation of transcription factor NF-kappaB by the Tat protein of human immunodeficiency virus type 1". Journal of Virology. 70 (7): 4427–37. PMC 190376 . PMID 8676466. Beauparlant P, Kwon H, Clarke M, Lin R, Sonenberg N, Wainberg M, Hiscott J (Sep 1996). "Transdominant mutants of I kappa B alpha block Tat-tumor necrosis factor synergistic activation of human immunodeficiency virus type 1 gene expression and virus multiplication". Journal of Virology. 70 (9): 5777–85. PMC 190591 . PMID 8709193. Ramazzotti E, Vignoli M, Re MC, Furlini G, La Placa M (May 1996). "Enhanced nuclear factor-kappa B activation induced by tumour necrosis factor-alpha in stably tat-transfected cells is associated with the presence of cell-surface-bound Tat protein". AIDS. 10 (5): 455–61. doi:10.1097/00002030-199605000-00002. PMID 8724035.